Start by wrapping two pipe cleaners around the headband to secure in place. Twist them together. Add a third pipe cleaner, starting at the base, and twist it around the other two until you get to the top. Leave enough for an antler to stick out. Repeat two more times to create two additional antlers. Next prepare a mixture of 1 part water and 1 part Modge Podge to paper mâché the newsprint around the pipe cleaners. Dip the entire strip of paper into the mixture. Slowly wrap it around the pipe cleaners, starting at the base and working your way up. Wrapping the paper can be a little tricky but it doesn’t have to be perfect. You can spend more time on it by making thinner strips that wrap tightly. Let the paper dry completely before painting. I left mine outside in the sun for a few hours. Once the paper is dry the antlers will be stiff and stay upright. Use acrylic paint to give the antlers color and create shadows and highlights. I used black, white and umber to create a light grey shade. Once the paint has dried you can create the ears. Fold a sheet of felt in half and cut out the shape of two ears. These can be any size based on the look you want. Cut the craft fur in a similar but smaller shape and use the hot glue gun to attach them to the felt. Wrap the ears around the headband and glue the two sides into place with the hot glue gun. 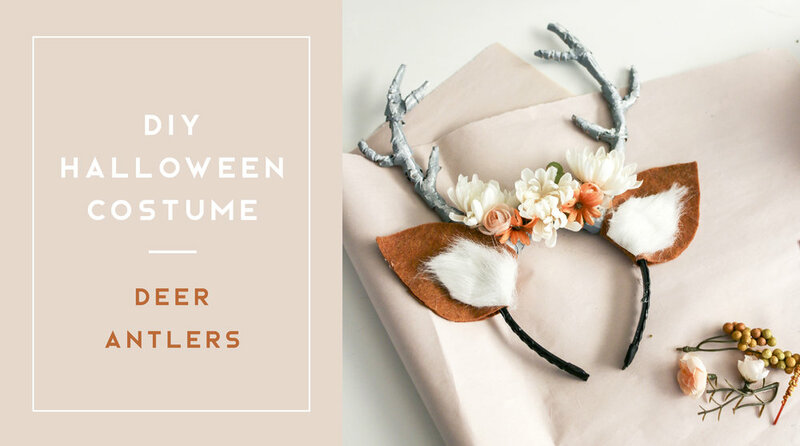 You can finish off the antlers by adding small artificial flowers in different colors to create a flower crown effect.